What are High Security Doors? 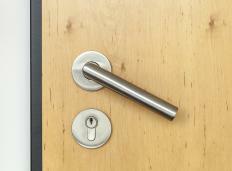 A locksmith may be responsible for installing locks on high security doors. Even the best neighborhoods can fall victim to criminals, and most homeowners find that it's better to be safe than sorry when considering their families' safety. Installing high security doors may be a good deterrent to the would-be home or business intruder. Many look like any other door, but they are made from steel or dense, heavy wood. People often prefer to use steel for doors because it is less likely to warp, and it won't peel like wood sometimes does. Steel doors are available in many attractive styles and finishes, so homeowners and businesses don't have to sacrifice style for security. High security doors are designed to fit more snugly in the door frame, preventing crevices and gaps, which also helps prevent many simple methods of gaining illegal entry. Because these doors are made to fit flush with their surrounds, it is quite difficult to pry one open. The door frame itself must be as secure as the door in order to provide good protection, as must the locks. People who are considering buying a security door would be wise to consult with a locksmith so he or she can help them select a quality option that suits their needs. It's usually best for homeowners to choose doors that do not contain glass windows, or that have laminated glass or bars inserted in window areas. Hinges that are accessible from the outside should employ a design that does not allow the hinge pin to be removed. While aluminum doors are generally affordable and adequate for many uses, they are not as sturdy or reliable as heavy wood or steel and may not be appropriate for use as a security door. Consumers should make sure any products described as high security doors meet industry standards before making a purchase. Most people can handle simple security measures on their own, including choosing high security doors. In some situations, however, it is advisable to consult with a security professional. While a strong door can provide quality protection for most homes and businesses, it may be a good idea to add caging as well in some circumstances. This is particularly true for spaces that contain valuable objects or information, especially if the location of the valuables is well known. What Is a Security Hinge? What Does a Physical Security Specialist Do? What are Security Storm Doors? How do I Choose the Best Iron Security Doors? What is a Privacy Lock?